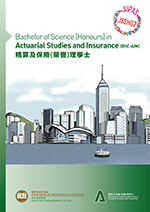 Bachelor of Science (Honours) in Actuarial Studies and Insurance programme (the Programme) is designed to train professionals who are of keen demand by the insurance industry. The insurance industry in Hong Kong is experiencing a rapid growth and in need of a continuous supply of talents. The education on insurance professions cannot catch up with the fast development of the local economy. There is a lack of opportunities for young people to understand the career path of various insurance specialities. As a result, the newcomers fall short in meeting the strong demand of human resources in the market. Our goal is to offer a platform to connect the students and the industry. The Programme provides professional training on actuarial studies and insurance practice to students, helps them prepare for their future career; meanwhile, brings in new blood to the industry and fulfill the market needs. develop students’ ability to make informed recommendations and decisions in a business context. apply the knowledge of insurance industry and financial concepts for solving problems. Our Programme is devoted to the advancement of teaching and research in actuarial studies and insurance. To provide quality education and promote high-calibre research in the area of actuarial studies and insurance. We offer a comprehensive education to equip our students with contemporary knowledge and practical skills, and to instil in students a strong sense of social responsibility and professionalism. We are committed to innovative research with contribution to the society.